Raccoons (Procyon lotor) are opportunistic, intelligent creatures that have adapted well to our urban and suburban landscapes. A general lack of predators combined with easy to access food sources such as garbage cans, compost bins, gardens and outdoor pet food bowls have allowed raccoons to proliferate even in the most developed of areas. Raccoons often occur in urban habitats at much higher densities than they do under more natural circumstances. Raccoons are primarily nocturnal animals but can be seen at any time of the day. Do not feed raccoons. Deliberate feeding of raccoons makes them more comfortable around humans and more likely to get into situations where they are unwanted or in danger. It also encourages unnaturally high population levels within a small geographic area. This creates a higher risk of disease transmission among the raccoons and increases the likelihood that they will become pests. It is much better and more humane to allow population levels to adjust to the food and habitat natural available. Feed pets indoors. Leaving food outside for pets is not a good idea as this attracts raccoons. 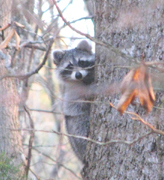 Feeding them inside will eliminate a raccoon attractant and will diminish the likelihood of an unwanted encounter between your pet and a wild animal. Feeding cats outdoors is especially an issue because cats should never be let outdoors. Seal-up all potential denning locations within your home. Placing caps on chimneys (which is bad for the declining Chimney Swift) and blocking outside entryways to basements, attics, and under porches will reduce the likelihood that you will wind-up sharing your home with a raccoon. Landscape for wildlife. Plant native vegetation and leave snags standing. Making natural food and shelter available will reduce the likelihood of unwanted human-raccoon interactions. Raccoons are not pets! Raccoons do not make good pets. Like all wild animals raccoons can carry diseases and parasites. When they reach sexual maturity they can become territorial and aggressive. It is illegal in the State of Tennessee to take a raccoon out of the wild to be kept as a pet. Identifying a "nuisance" raccoon. Raccoons are a fact of urban living. In many cases, tolerance and prevention (eliminating unnatural food sources, sealing up potential denning locations) is the best approach. If you do find yourself in conflict with your local raccoon population, the first thing to consider is identifying the source of the problem. What is attracting the raccoon to your property? Is there a way to eliminate the attractant? Do you need to speak with your neighbors about doing the same? The vast majority of urban raccoon conflicts occur because somebody in the neighborhood is either deliberately or inadvertently providing some sort of unnatural food source for the raccoons. Raccoons are raiding my garbage cans! Raccoons will take advantage of any available food source and are well-known raiders of garbage cans. Garbage cans should be secured tightly to prevent a raccoon's access. You can fasten the lid securely with rope, bungee cords or weights. Garbage cans can be secured to a wooden stake or wall to prevent being knocked over. Commercial repellants can also be sprayed directly onto garbage cans to deter raccoons. A raccoon is denning under my porch, deck or house. Exclusion is the best way to prevent a raccoon from making its home under your porch, deck or house. If there is a raccoon, find out if it has young in the den. If there are young present it is best to wait till the young are able to leave the den with their mother before trying any exclusion techniques. Close off all but one entrance or exit to the den. Wait until all raccoons have left before sealing up the final entrance. To urge a raccoon with young out of a den, place a small battery operate radio set to a talk station into the den. This disturbance will help to convince the raccoon to relocate her young to a new location. Seal up the entrance to the den when you are sure all raccoons have vacated. Raccoons are digging up my garden and lawn. Raccoons have a varied diet and sometimes find food sources in our gardens or lawn. Commercial or natural repellants can be used on small areas to deter raccoons. Commercially available animal repellants can be applied around the perimeter of affected area of lawn or garden. Repellants are not species specific and should be used with caution with outdoor pets. Scare tactics such as bright, blinking lights or a loud radio can be used in gardens to deter raccoons. Raccoons are fighting with my cat or dog! Most conflicts with pets occur because of competition over outdoor food bowls. The best way to prevent these types of conflicts is to feed pets indoors. Raccoons will also protect their dens from dogs. If you know you have a denning raccoon in the area, keep dogs under control and house them indoors at night when raccoons are most active. Won't the raccoons starve if we stop feeding them? No. Raccoons are capable of traveling great distances to find food and territory. If you stop feeding, raccoon populations will slowly adjust to the level that can be accommodated by the available natural habitat. Although it is well intentioned, intentional feeding of raccoons is highly destructive to the animals. Raccoons that become habituated to human handouts are likely to become pests. Unnaturally large congregations of raccoons leads to territorial conflicts and disease outbreaks. If you care about raccoons, please don't feed them! Relocation is not a solution. Relocation is ineffective and is illegal in some areas of Tennessee due to rabies. Contact your regional TWRA office for information of relocating raccoons and whether it is legal or not in your area. Relocation is inhumane. Although many people perceive relocation as a humane approach to resolving conflicts, it is in fact just the opposite. Relocated raccoons have to fight with already established raccoons for territory, food and shelter. 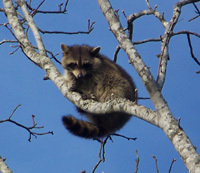 Many raccoons do not survive relocation and those that do disrupt already established populations. Relocated raccoon kits are almost always abandoned as it is near impossible for a mother to carry and care for her young while also establishing herself in a new territory. Relocation is ecologically destructive. Relocation of raccoons disrupts already established populations. Excessive dumping of raccoons into natural areas may result in ecological damage and has been implicated in the transmission of disease among otherwise unaffected populations. Many local parks and natural areas now have policies prohibiting the dumping of raccoons. Relocation requires permits. Raccoons are protected under state law and relocation of these animals requires permits from the Tennessee Wildlife Resources Agency. If you hire a professional wildlife relocation service, be sure to ask to see their state permits prior to signing the contract. *This document is based on an article entitled "Raccoons" by the Audubon Society of Portland.